Water on the Bridge is a surreal and playful exploration of care, violence and letting go through the unlikely pairing of cellos and water. An ongoing project now with three iterations, Katinka Kleijn and Lia Kohl create site specific work exploring the possibilities of cellos in and around bodies of water. Each iteration incorporates elements of theatre, movement, and improvisation, as well as a rich sonic landscape drawn from both water and cellos. The first two iterations, collaborations with New Orleans-based cellist Helen Gillet and Chicago dancer Jasmine Mendoza, respectively, took place on (and in) Lake Michigan as part of Water Music, organized by art space 60618 North. Following wild, highly improvisatory arcs, both pieces explored the lake as a site of both safe harbour and embarking point. 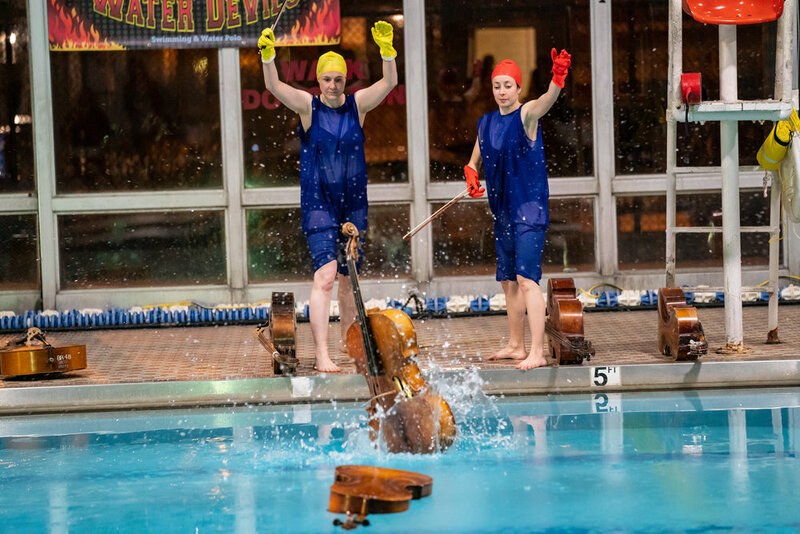 The project’s first full scale performance took place in March 2019, and was performed with 30 cellos in and out of the swimming pool in the Eckhart Park Natatorium. The pair played, floated and moved around the cellos accompanied by live electronics and recordings.